Are you looking for a way to make a new neighbor feel right at home? I have a new neighbor gift tag that you can add onto just about anything. This year alone, we welcomed several different families onto our block. It’s always such a joyous occasion! You wait outside and try to see whether or not they have children the same age as your own. LOL! I can’t be the only nosy one that does that, right? 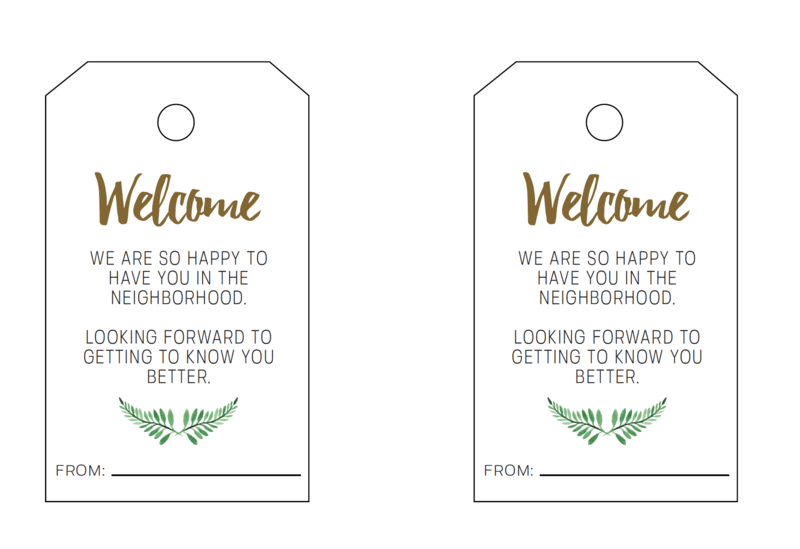 These Welcome to the Neighborhood tag downloads are a perfect way for you to wrap up something special and introduce yourself to your new friends. 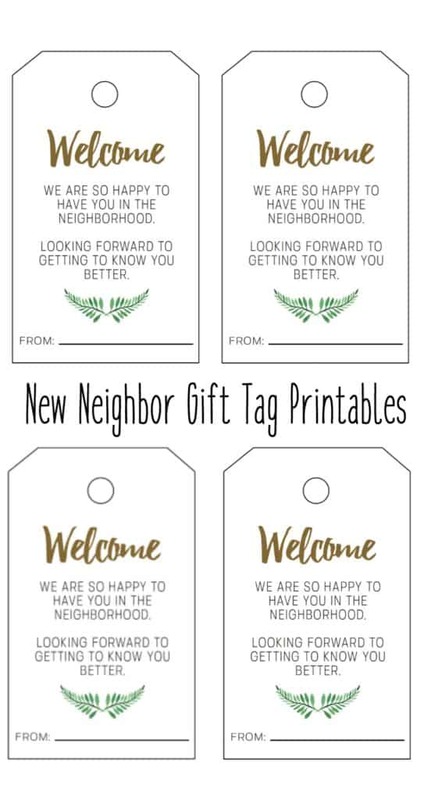 Click here to download a copy of the New Neighbor Gift Tag Printable. I left a place for you to personalize the greeting with a signature. There is also a hole punch cut out on top which will help you easily attach this tag to anything you have. Personally, I would use twine string, but that’s just me! Every gift has its own personal flair. Make it your own. The New Neighbor Gift Tag Printable comes with 4 separate tags per page. Just in case you want to share this idea with other neighbors that maybe aren’t so computer savvy or don’t have time to think about final touches. A bottle of wine, some ribbon, and this New Neighbor Gift Tag Printable will go a long way! Trust me. What Are Some New Neighbor Gift Ideas – Housewarming Gifts? Housewarming gifts really can make a new neighbor feel welcomed in their space. It is a small gesture on your part and it could make a huge difference in somebody’s mood. Moving is a BIG DEAL. It is stressful. It is time-consuming. It is a crazy experience. I’ve done it a few times and I still have nightmares about it all. When a random person shows up at your door with a plateful of kindness, it can truly bring a little sunshine to your day. Be that sunshine. Be sure to print your Welcome To The Neighborhood tags today! Click here, save them to your desktop and print as many copies as you’d like. Have you ever received a Welcome to the Neighborhood gift from a friend? How did it make you feel? Would love to hear!